“What we are seeing now, and I think it is a new moment in Christian history, more Protestant and Evangelical churches have a very strong desire of wanting to use a visual language in the mission,” King’s College professor of Christianity and the arts Ben Quash told The Christian Post on Friday. 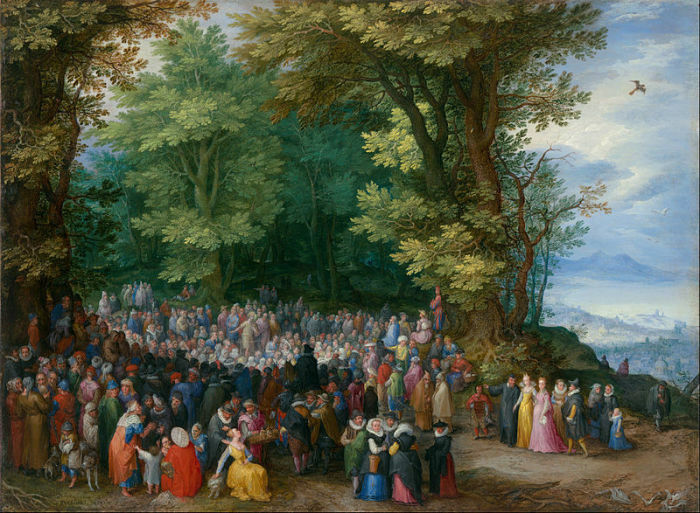 One example is the VCS exhibition of the “Sermon on the Mount,” which is accompanied by a 1481–1482 fresco by Italian painter Cosimo Roselli, a 1442 fresco by Italian painter Fra Angelico and a 1598 oil painting by Flemish painter Jan Brueghel the Elder. According to Quash, the goal is to have over 1,500 scripture exhibitions included in the project with about 240 being produced per year. The shortest scriptural passage in the project currently is two verses long and the longest passage is three chapters. Quash, who joined King's College London as its first professor of Christianity, told CP that the goal to reach 1,500 exhibitions could take five years or more. But Quash believes the project will enable people to read the Bible in a new way. “This is something that people wherever they are … they can engage with a short passage of Scripture and have their imagination kindled by the works of art and be stimulated to come into the presence of the biblical text through their hand-held devices and [computers],” Quash stated. As the exhibitions are composed by various authors, Quash maintains that he and his King’s colleagues maintain a very high level of standard. “Although we want to reach a very wide public, nevertheless it is a scholarly project,” Quash, who heads the first master's program in the world that is a joint enterprise between a theology school and a major international art gallery (the National Gallery in London), said. Quash said that the biggest challenge the project faces is getting artwork and writers from outside of North America and Europe. The project does already include a few pieces of art from Latin America, Asia, and Africa. “It is very important to me that we have art and people writing from beyond the Western world,” Quash stressed. Quash also aspires to have the VCS available in several world languages, including Chinese. He is also hopeful the VCS will be used an educational resource in schools and colleges throughout the world. According to Quash, the project was partly inspired by the Ancient Christian Commentary on Scripture, a multi-volume book set in which the biblical text is surrounded by classical commentary from early church theologians. “The idea was to get people to realize the depth of the commentary tradition in the early centuries of Christianity and give them an opportunity to read the Bible in the company of the great early church theologians,” Quash said.